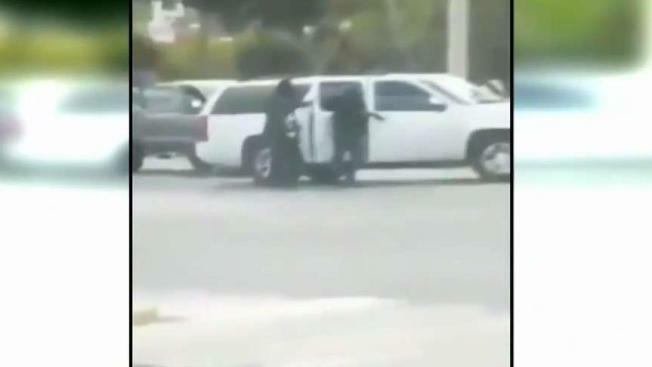 The city of Tijuana is on alert after video surfaced of the broad-daylight kidnapping of two adult sons of a former cartel operator. The kidnapping occurred amid afternoon traffic on Wednesday in the so-called armored zone at the intersection of Paseo de los Héroes and Sánchez Taboada, one of the safest parts of the city. The State Attorney General's Office confirmed that the victims were released, but because they haven't filed a formal complaint it is unknown if they suffered any injuries. “Across the street there is a kindergarten. Imagine what could've happened if there was a shooting,” said Alina Ramos, a teacher from a school near the scene told Telemundo 20. The area, unfamiliar with this degree of violence, immediately became surrounded with law enforcement. "The truth was, I was surprised because it is the least likely area that something like this could happen," said Ramos. Authorities said that groups in five cars played a hand in the kidnapping of two men. "The event itself, the execution of the incident lasted 50 seconds and it was very, very fast," said Marco Sotomayor, Chief of the Tijuana Police Department. The event was planned ahead of time and involved a profile of unusual citizens, authorities said. "In the place was a Ford Ranger in which the victims circulated who we know are the children of an operator of a criminal group of this city that is currently in prison," Sotomayor said. The police chief said that the victims are two children of Jesús Labra Avilés, also known as “El Chuy,” who was the financial operator of the Arellano Félix Cartel in the 1980s. Experts told Telemundo 20 that the kidnapping represents a new chapter in the wave of violence in Tijuana. "What we saw yesterday, for me, is nothing more than a declaration of war that is no longer in the world of drug dealing, we are talking about other levels," said Víctor Clark, Director of the Binational Center for Human Rights. "People in black, hooded, those figures, those scenarios we have not seen in Tijuana for a long time," Clark said. Avilés was arrested in 2000 a few miles from where his children were kidnapped. He was extradited to the U.S. and is currently serving a 40-year prison sentence. Sotomayor called the incident unfortunate, and said that authorities will increase patrols in the area. “We will count on tactical groups behind the police force to avoid a high impact accident,” said Sotomayor.